The Baby Lock Soprano lets you hit the high notes with ease. 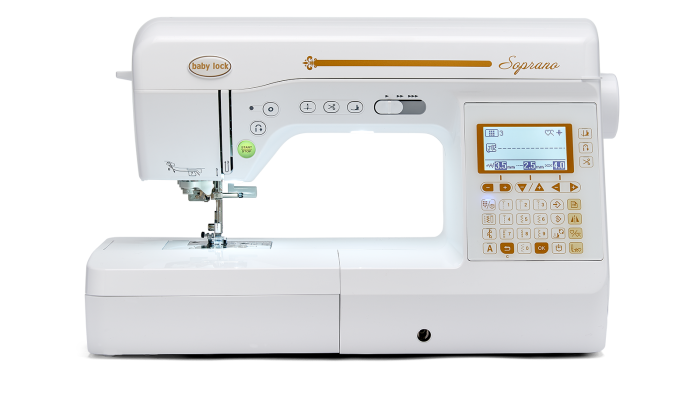 It's easy to get started with the advanced needle threader & quick-set, top-loading bobbin. You will be all set to quilt in no time, and you will love having a machine that helps you get things done quickly. The Advanced Pivoting Feature is an especially handy tool. It makes it easy to turn corners and curves that don't always follow "the rules" in your modern quilt patterns. You'll also love the Automatic Fabric Sensor System - which delivers the right amount of tension for your stitches no matter what type of fabric you use. And with 300 built-in stitches and tons of accessory feet, you will never miss a beat when you use your Soprano.